Flutist Nicole Riner, left, composer and clarinetist Anne Guzzo, middle, and soprano Maureen Sorensson will perform Guzzo's latest piece, "Haddayr Blogs," Friday, Oct. 30, during the UW music department's New Frontiers Festival of New Music. The New Frontiers Festival of New Music, sponsored by the University of Wyoming Department of Music, will feature four concerts between Monday, Oct. 26, and Friday, Oct. 30. Tickets for the Monday and Friday night concerts, $7 for the public and $5 for students and seniors, are available by calling the Fine Arts Center box office at (307) 766-6666 or at the Web site www.uwyo.edu/finearts. There is no charge for the Wednesday and Thursday concerts. 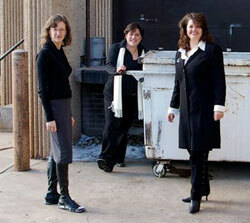 Monday's concert, "Scores and Surfeits," will be at 7:30 p.m. in the Fine Arts Center concert hall. UW music department faculty members will perform works by iconic modernist John Cage and Argentine composer Astor Pizzola. Wednesday's concert will feature the festival's ensemble-in-residence, "Telling Stories," of Denver, Colo. "Telling Stories" is a "hip, young group that brings classical music and readings to coffee shops and pubs." This performance will be at 8 p.m. at Coal Creek Coffee, located at 110 E. Grand Ave. in downtown Laramie. The performance is free, but donations will be accepted. Thursday's concert, "New Frontiers: Wind Ensemble" will feature the UW Wind Ensemble, directed by Robert Belser, at 7:30 p.m. in the UW Fine Arts Center concert hall. The free performance will include the premiere of a new symphony by David Maslanka. Friday's concert, "New Frontiers: Voices and Devils Concert" will be at 7:30 p.m. in the UW Fine Arts Center concert hall. Composer-in-Residence Eric Sawyer of Boston, and UW composer Anne Guzzo both will present the premiere performances of their latest works. The concert will also feature performances by guest violist Polly Malan of San Francisco, the UW Collegiate Chorale directed by Nicole Lamartine, and a full production of Stravinsky's classic battle of good and evil, "Soldier's Tale." For more information, e-mail festival director Anne Guzzo at guzzo@uwyo.edu, or call her at (307) 766-5109.